Last night a young lady called me. She’s in a very sticky situation. She is currently separated from her husband. A young man from church started pursuing a relationship with her. She’s not interested in him romantically and has made that clear. But they are talking and becoming friends due to their common interest in the things of God. Whew! That’s tough. When you are praying and yet don’t see the results you had hoped for, what can you do? We talked for some time. She’s been growing rapidly in hearing from God and learning His ways. One thing she said that caught my attention – “feeling forced” to be his friend. I asked her about it. She said she feels this pressure and she wonders if it’s God or not. She’s afraid to cut things off with him because she’s not sure if maybe God WANTS her to be friends with him. I told her that there’s a big difference between following the leading of the Lord and the feeling of being forced or pushed. I sent her this chart I made to help her discern when it’s God voice or some other voice. I know this chart has helped me – sometimes when we feel unclear about something and especially if our emotions are involved, this can help bring clarity about exactly whose voice we are following. Some charts I’ve seen contrast God’s voice to Satan’s voice. 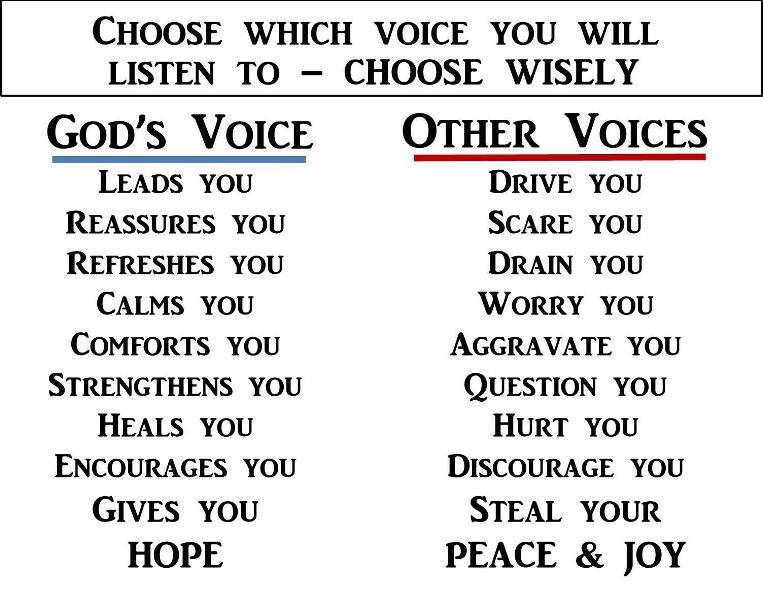 I chose to contrast God’s voice to “other voices” because sometimes that voice is our own! We are sometimes our own worst enemy – we tell ourselves what we “should” be doing, using guilt and manipulation to get ourselves to do things. Sometimes that “other voice” is someone in our lives giving us advice or telling us what we should do. This chart can help us figure out whether what they are saying lines up with the Lord’s voice. And yes, sometimes that “other voice” is the enemy, Satan, whispering things into our minds (which sounds like our own thoughts). I encouraged her to keep that chart somewhere she could refer to it frequently. You might want to do the same. So how do you know when it’s God’s voice versus Other voices? Feel free to share your experience below. What advice would you have given her? One of the ways God speaks to us is through dreams. Has this ever happened to you? How can you tell when it’s God speaking to you? Sometimes it is obvious and other times, you might not be so sure. Here’s a dream I had recently where it was obvious to me that God was speaking to me. This time I heard him clearly. I suddenly realized I had lost some of my hearing in my left ear. This surprised me because I didn’t know this and he did. When I turned my right ear toward him, I heard him clearly – he was so close I could feel his breath as he spoke. Immediately I woke up – my husband had awakened me because it was time to go to a doctor’s appointment for him to be cleared for surgery. I knew this was a dream from God. How did I know? I remembered the dream in detail. When God wants to speak to us in a dream, then obviously we will remember it clearly. Many times I remember little bits and pieces of a dream, but when I can clearly remember the whole dream in detail, I pay attention. God may be speaking to me. The dream involved my father. From my personal experience with God, whenever I dream about my natural father, it represents God, my heavenly Father. That may not be true of everyone – this is just how God relates to me. There was a clear message – God wants me to know that He loves me. The feeling I had when I woke up stayed with me all day. It was more than just a natural father’s love – it had a depth and completeness to it that is hard to describe. I felt embraced by this love in my entire being – it created not only comfort but a strong sense of security and protection. I was safe and cared for in His love! I couldn’t stop thinking about the dream all day long. Many times when God is trying to get your attention, He will make sure the dream stays fresh in your mind until you get the entire message. I have also heard that often dreams from God involve bright colors – you’ll remember a specific color that was in your dream (i.e. someone was wearing a green shirt or you saw a red stop sign). I don’t recall any specific colors in this dream. It has been my experience that color does play a role – if I have a difficult dream that is all in shades of gray and black, it is often a revelation of the strategy of the enemy. I pay attention to those too and ask the Lord what I need to know. It may reveal what is happening in the unseen realm regarding me, my family or something happening in my region or nation. Often He will show me something I need to be praying about. Sometimes dreams are confusing – the best thing to do is simply ask God to show you what He is saying, if the dream is from Him. Meditate on any themes or feelings you had in the dream. Sometimes you’ll get greater clarity if you take the time to write it down or tell it to a friend. But if no insight comes, don’t worry about it. God has ways of getting your attention. He’ll get the message through to you one way or another! Have you ever had a dream that you knew was from God? What did it tell you? How did it help you? Feel free to share it with us below.